DKG Ltd, a specialist in cultivation advice and for many years an important partner for Grodan, the supplier of innovative substrate solutions for greenhouse horticulture, will be taking on the additional role of sales organisation and exclusive outsourcing partner for Greece, Cyprus, the Balkan countries and Egypt with effect from 1 January 2009. The company expects to be able to provide buyers of Grodan products with an even better service through the expansion of its range of tasks. Grodan, founded in 1969, is active in more than 40 countries. The headquarters are located in Roermond, the Netherlands. 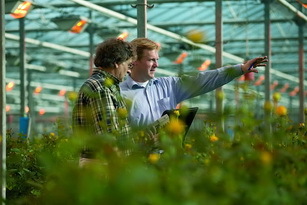 Grodan supplies innovative cultivation solutions to the professional horticultural sector comprised of clean and controllable substrate, in combination with advice and support services. Grodan’s substrates constitute the alternative for soil for the professional horticulture sector. Cultivation using these substrates is not only considerably more environmentally-friendly and easier to manage; it also offers an increased yield, better quality and the opportunity to make savings in fertiliser, water, and energy consumption. The solutions are, in particular, employed in the cultivation of vegetables and flowers, such as tomato, cucumber, sweet pepper, aubergine, strawberries, lettuce, fresh bean, melon, roses, gerberas, carnations, chrysanthemums. Grodan is a member of the Rockwool Group, the global market leader in products manufactured on the basis of stone wool. The various Rockwool companies manufacture a large and wide range of stone-wool products that make optimum use of stone wool’s unique properties. Rockwool’s 22 factories in 14 countries generate a turnover of more than 1.8 billion euros and offer jobs to some 8,500 employees. The headquarters are in Denmark, near Copenhagen. DKG Ltd, a consulting, inspection and training facilitator body with international presence, strategic collaborations and partnerships, offers specialized sustainable solutions to individuals, professional groups and corporations within the fresh produce and agro supplies trade industry. DKG Ltd respects the environment, supports sustainable development and is committed to environmentally sound business practices. To fulfil this commitment, DKG Ltd integrates environmental principles, programmes and practices into each business, strives for the continuous improvement of its environmental performance through application of the DKG Environmental Management System and provides appropriate information, communication and training to build internal and external understanding concerning the company's environmental commitment.